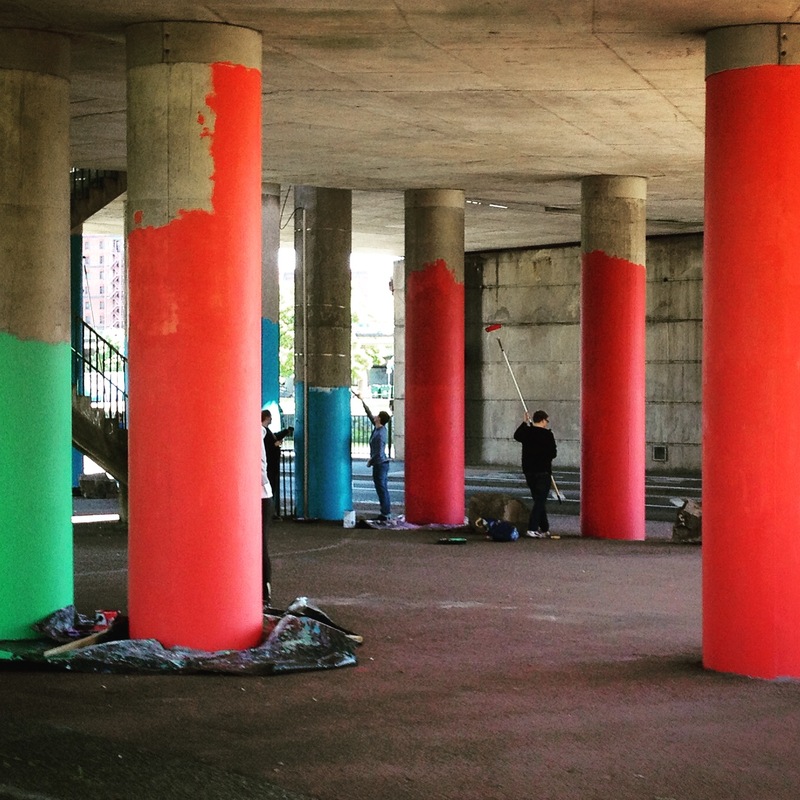 Last weekend some lovely overseas postgrad students came down to the Cumberland Piazza in Hotwells to help Art Under the Flyover, an HCCA project, paint pillars. It’s the second time some of them have been. One couple live locally, and the first time they came along I immediately handed them an hour’s worth of paint brush washing, which they did with real kindness. I was delighted that they offered again and brought some friends. Our neighbourhood has a huge student population and I occasionally hear some really negative things, like, ‘they’re transient, aren’t they?’, ‘they don’t care about the community’, ‘they just make loads of noise at night and leave their rubbish all over the street.’ Is this the whole story? Certainly not the case with Malin and Caleb, from Germany and the US, who painted pillars. Only here for a short time, they got involved and are helping improve our local environment. I totally ‘HEART’ them, as my Instagram-ing 5-yr old would say. But there’s something more serious going on than Instagram ‘heart-ing’. The Bristol Big Give was set up in 2014, raising £180,000 for charity, supported by the UBU Get Green programme. The latest Big Give event was in march this year, in partnership with the British Heart Foundation. You may have seen the big red recycling points dotted around the neighbourhood. This is a wonderful example of students putting hearts and minds in to helping us re-use our ‘rubbish’ and raising money for charity. Did you borrow or lend a cup of sugar? How well did you get to know your neighbours? Where did you find the household items you needed? 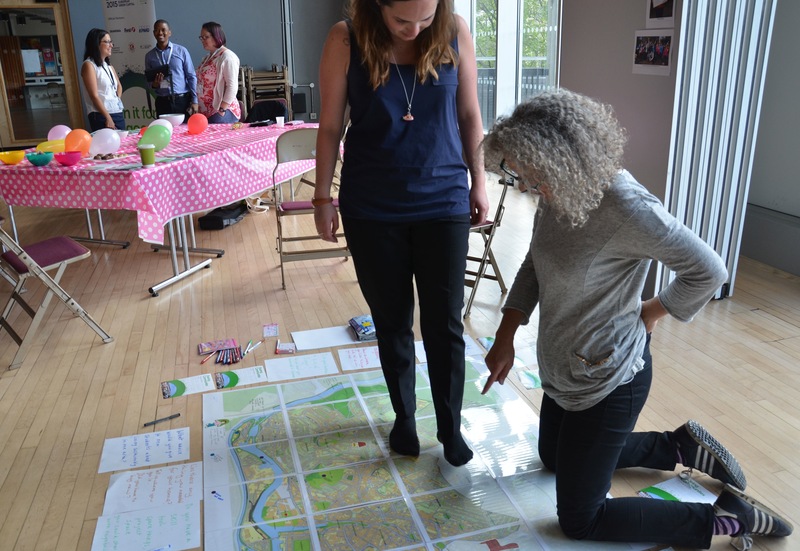 What did you get involved with locally? Did you have any issues with re-use & recycling? Would you consider swapping your skill for assets from your neighbours? So, Sharing Communities is going to work with UBU Get Green to do an event in freshers week 2015 which introduces new students to information and ideas about how they can access items that their neighbours no longer need and can offer their skills to local residents. When I was a student I lived all over London and did odd jobs for people like cleaning, nannying and gardening. I left college with no debt (those were the days of no fees- imagine!) and I got to know neighbours. My most regular gig was with Eileen Cooper, who encouraged and inspired me to study fine art, and who’s oldest son taught me everything I know about dealing with creative children of unique willpower! I would cherish (and pay) a student to help me out- as a freelancer I can’t commit to a childminder, can’t afford a cleaner, but do need help sometimes! And perhaps my daughter could teach a student about managing unique and creative willpower in turn! Let’s all ‘HEART’ our students and not just see them as a transient population, but as an integral part of our community, people we can share with, swap with and enjoy.